Take a CUE from people who appreciate a good beer stein! The suds will really be flowing into this billiards themed mug. 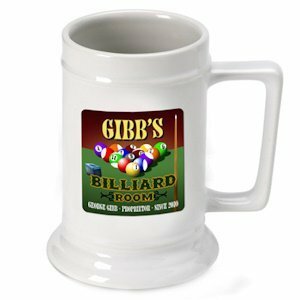 The white, ceramic beer stein is printed in full-color with a design that features a rack of billiard balls set up for the break. Personalized with first name, last name and date that the billiard hall (or the player) was established. Holds up to 16 ounces.